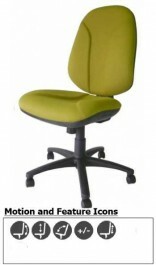 The Lombare High Back VDU Operators Chair Offers A Deeply Contoured Seat And Back For Complete Posture Support. UK Manufactured. 5 Year Guarantee. Choose from Main Line Plus Fabric or Chieftain Just Colour Vinyl Both Coverings are tested to Crib 5 Fire Standards and the Chieftain Vinyl is a NHS approved vinyl covering.